Question: So you’ve secured your spot at an upcoming tradeshow, prepared your marketing materials and your staff is bringing their A game to make the pitch to your targeted audience. But what’s really going to make you stand out from your competitors AND get potential customers to stop for a meaningful period of time at your booth? 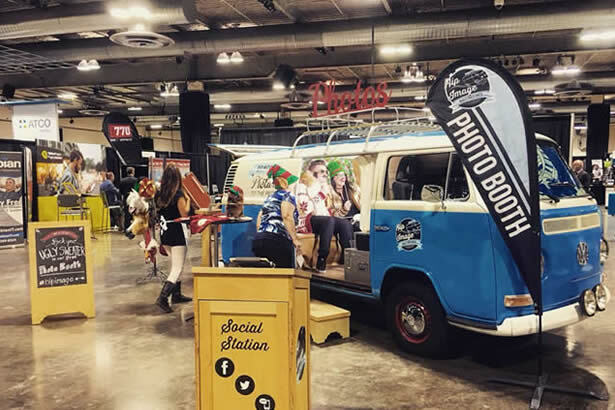 Answer: A branded photo booth with data (email) collection capabilities, social-media friendly platform where you can drive traffic with your hashtag and potentially run social contests that will extend your brand reach via your newly formed relationships with tradeshow attendees. Your tradeshow goals likely include connecting with potential clients. Often it can be difficult to get people to take notice and stop long enough for a significant interaction when you are competing with so many other vendors. 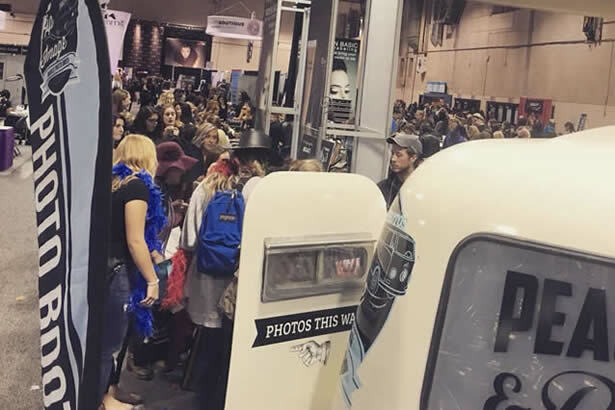 With the rise in popularity of photo booths, combined with the ability to infuse the photo booth with your brand, options to collect attendees’ emails, run social media contests and promote hashtag interactions, photo booths can be a very valuable addition to your tradeshow presence and draw instant attention to your company. For tradeshow booths with limited space, we can run our social media powerhouse in a small package. 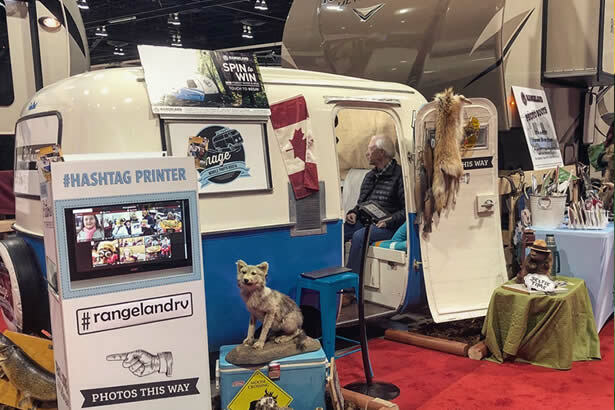 The Hashtag Printer is an Instagram or Twitter enabled photo booth where guests use their own smartphones to take photos, get a custom branded print (the carrot) by using your pre-determined hashtag. We often combine the Hashtag Printer with our other units for even greater impact. Just another photo booth? Not quite! Our brand “new” vintage pop-up photo booth cleverly hides studio grade equipment in an exquisitely styled unit. 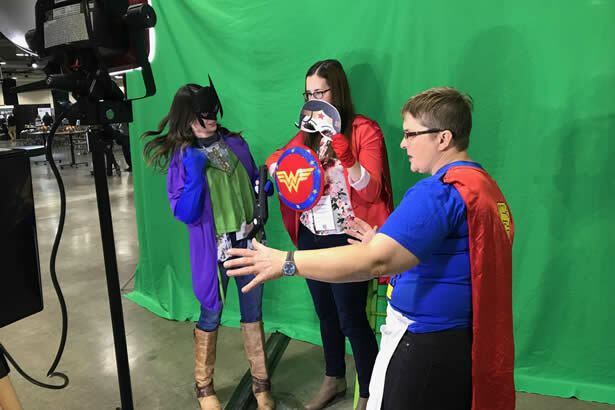 We can do branded installs, create 3-D sets, green screen backdrops to place your guests in any environment, develop custom props for your theme and brand, or simply use one of our beautiful backdrops with customized photo template for print and digital, digital sharing and social media posting. Have room and want to make the maximum impact on your guests? 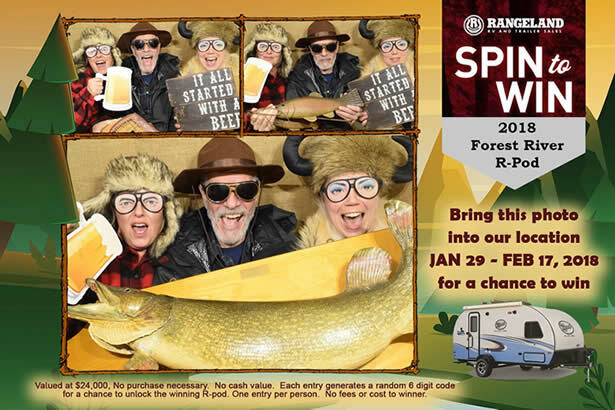 Our unique VW Bus and one-of-a-kind Boler trailer photo booths can fit the bill! Our candy-like units are just too tempting to pass by! Both the VW and Boler photo booths are fully retro outside, with a totally modern photo booth surprise waiting inside. Prints snapped on a DSLR are developed into a high quality print within seconds for your enjoyment. These booths also include custom branded templates, unlimited prints, social sharing and customized email with URL. 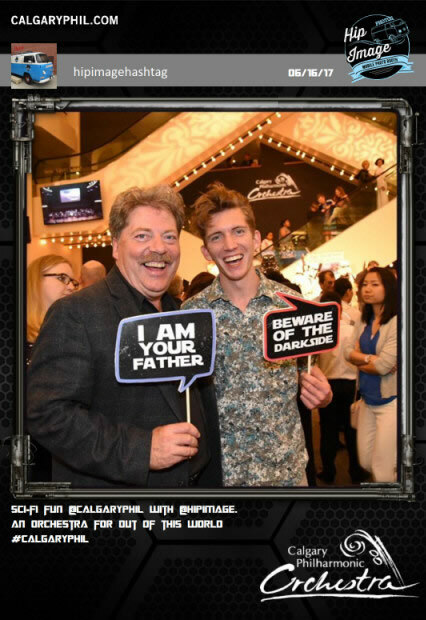 At Hip Image, we not only offer the latest in photo booth technology, data collection and social sharing, our team genuinely becomes an extension of your sales team. We take time to understand your brand value, your key messages and can be the extra person you need on the floor. 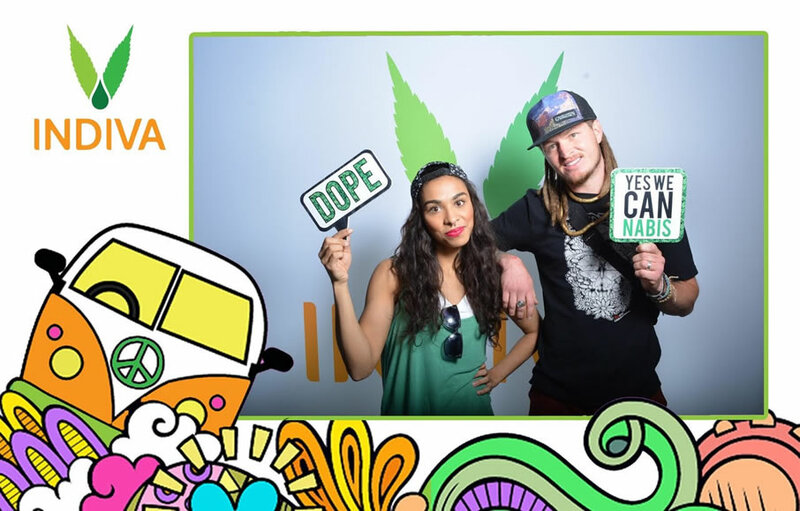 All of our photo booths come with social media sharing stations to help increase your brand exposure by creating fun visual content that people want to share on their own social networks including your hashtag. We know that it takes outstanding creativity to get noticed in the social media space. That’s where we come in. With creative, personalized events made visual, you’re bound to get people talking on the social grapevine with our images. We can also help design social media contests—designed to increase your reach beyond the tradeshow floor into attendees’ own social circles. 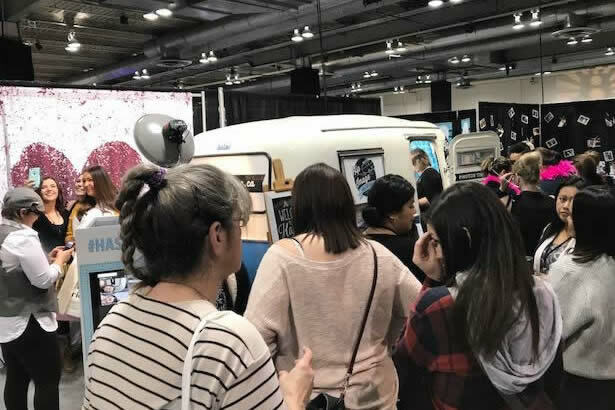 If you want to make your tradeshow booth stand out (and hey, who doesn’t), have potential clients actually stop and interact with your brand, collect valuable data, tap into social media potential, then talk to us. 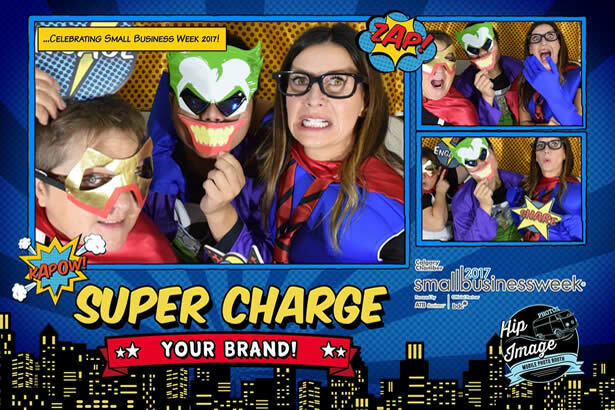 We are your photo booth tradeshow experts.